Will you be able to sleep once you see your child in the Nightmare Freddy Child Costume? 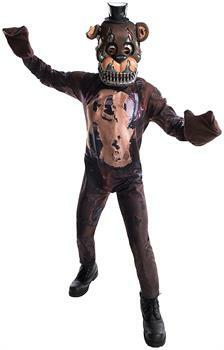 The jumpsuit, mitts and mask are based on the Freddy Fazbear that haunts a child's dreams in Five Nights at Freddy's 4. Freddy was creepy enough in the previous 3 games when he became animated at night in his pizza parlor. Now he is even more so, with a rotting coat that reveals the animatronics inside. Your child can brave this outfit, but can you?